THE B-MOVIE NEWS VAULT: Full Specs & Extras for Scream Factory's THE SERPENT AND THE RAINBOW Blu-ray! 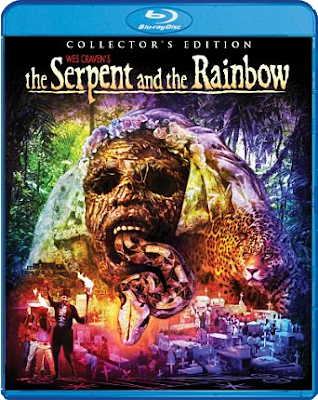 Full Specs & Extras for Scream Factory's THE SERPENT AND THE RAINBOW Blu-ray! SCREAM FACTORY'S DELAYED COLLECTOR'S EDITION OF WES CRAVEN'S VOODOO CLASSIC WILL FINALLY BE AVAILABLE ON FEBRUARY 23RD! Many of us are still reeling over last year's tragic passing of director Wes Craven. He will be sorely missed by his fans and all those who worked alongside him to create his amazing body of work. Rest in peace Wes, and thanks for the scares! In regards to this Blu-ray disc, it has been delayed by several months because the powers that be at Scream Factory wanted to make their final Wes Craven release PERFECT. The HD transfer of the film was made from an original inter-positive and is guaranteed to be the best presentation of THE SERPENT AND THE RAINBOW that you will ever see! Film Synopsis: A Harvard anthropologist (Bill Pullman) is sent to Haiti to retrieve a strange powder that is said to have the power to bring human beings back from the dead. In his quest to find the miracle drug, the cynical scientist enters the rarely seen netherworld of walking zombies, blood rites and ancient curses. Based on the true life experiences of Wade Davis and filmed on location in Haiti, it's a frightening excursion into black magic and the supernatural. Directed by Craven and executive produced by Rob Cohen (THE FAST AND THE FURIOUS, THE RUNNING MAN), and Keith Barish (THE FUGITIVE, BIG TROUBLE IN LITTLE CHINA), the film stars Bill Pullman (INDEPENDENCE DAY, LAKE PLACID), Cathy Tyson (PRIEST, NEIL JORDAN'S MONA LISA), Zakes Mokae (WATERWORLD, THE ISLAND), and Paul Winfield (STAR TREK II: THE WRATH OF KAHN, THE TERMINATOR). NEW audio commentary with actor Bill Pullman. NEW The Making of The Serpent and the Rainbow featuring new interviews with actor Bill Pullman, author Wade Davis, director of photography John Lindley, and special makeup effects artists Lance Anderson and David Anderson. This highly anticipated Scream Factory title hits retailers on February 2nd, 2016 and boasts new cover artwork by artist Joel Robinson. 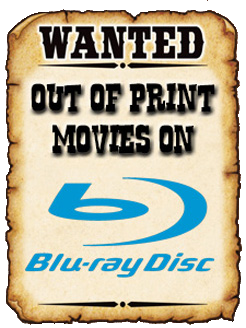 You can order it right now from AMAZON.COM or order it direct from SHOUTFACTORY.COM and get it TWO WEEKS EARLY with a collectible 18 x 24 poster featuring the new cover art! A big thanks to Scream Factory for making the extra effort on this disc in order to give us the best possible transfer of this Craven classic!